Dr. Klon K. Kitchen, Jr. was born in Richmond, VA. He was first ordained in 1974 by The Salvation Army after completing the School For Officers Training in Atlanta, GA. He has his Bachelor and Masters degree in Bible Theology, Doctor of Divinity and Doctor of Biblical Philosophy degree from International Seminary, Plymouth, FL. 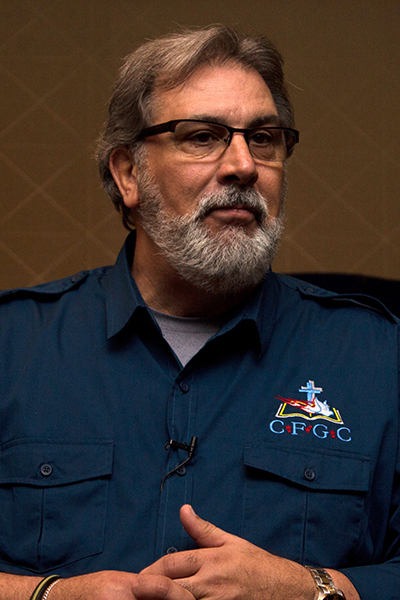 He graduated from a year residency in Clinical Pastoral Education in 1997 in San Antonio, Texas. He holds current ordination credentials from Trinity Full Gospel Fellowship of Cedar Hill, Texas. He is a retired US Army Chaplain and now serves as the Executive Director & Endorser for Chaplaincy of Full Gospel Churches, Inc. and President of Trinity Full Gospel Fellowship located in Cedar Hill, Texas. Dr. Kitchen is a member of the Executive Committee of the National Conference on Ministry to the Armed Forces (NCMAF), Member of Endorsers Conference for Veterans Affairs Chaplaincy (ECVAC), founding member and steering committee member of the Chaplain Alliance For Religious Liberty (CALL), lifetime member of the Military Officers Association of America (MOAA) and the Military Chaplains Association (MCA) and lifetime member of the United States Army Chaplain Corps Regimental Association (USACCRA). Dr. Kitchen has authored many articles for several different publications. Dr. Kitchen also presently serves as a volunteer Chaplain for the United States Secret Service. Dr. Kitchen served as the Commanding Officer for two Salvation Army Churches and Associate Pastor for the Home Church with the International Christian Churches while also serving as an Adjunct Faculty member for International Seminary. Chaplain Kitchen was first commissioned in the United States Navy as a Chaplain Lieutenant Junior Grade in 1987. In May of 1997, he transferred to the U.S. Army and was commissioned as a Chaplain Captain. His last assignment on active duty was as the Garrison Command Chaplain at United States Army Garrison Humphreys (USAG) and Area III, South Korea where he held the rank of Lieutenant Colonel. His military education includes graduation from the United States Naval Officers Candidates School, Newport, RI. He received his certification for Aviation Physiology, Emergency Egress and Water Survival. He has graduated from the United States Army Chaplain Basic Course, Chaplain’s Advanced Course, C3 and Command and General Staff College (ILE). He was awarded the 7R Designator (Hospital Ministries) in 1997 after graduating from a 1 year residency program in Clinical Pastoral Education (CPE) as well as being trained in Family Life Counseling. He earned the 5K Designator as Army Instructor in 1998. He is a Certified Instructor with the Reina Trust Building In The Workplace Program and a graduate of the Family Advocacy Staff Training (FAST) & (FAST-S). Military assignments include: U.S. Naval Station Roosevelt Roads, PR with additional duties as the Executive Director of the Navy Relief Society branch, Puerto Rico; Battalion Chaplain for Naval Mobil Construction Battalion 74; Command Chaplain for USS Sylvania (AFS-2) with Desert Shield/Desert Storm; Assistant Group Chaplain for Marine Aircraft Group 31 with Operations Deny Flight/Provide Promise; his U.S. Army assignments are Tripler Army Medical Hospital, HI; 603d Aviation Support Battalion at Ft. Stewart, GA; Brigade Chaplain for the 4th Aviation Brigade, 4ID, Ft. Hood, TX with Operation Iraqi Freedom; Family Life, Unit Ministry Team Training and Mobilization Chaplain as well as the Main Post Chapel Complex Officer in Charge & Pastor at Ft. Jackson, SC and the Area III & Garrison Command Chaplain, USAG Humphreys, South Korea. 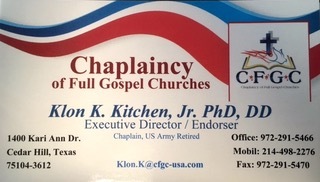 Chaplain Kitchen’s awards include the Bronze Star, Meritorious Service Medal x2, USA Com Med x2, Navy Com Med x2, Army Ach Med, Navy Ach Med x3, National Defense Med x2, Armed Forces Expeditionary Med, SW Asian Med x3, Global War on Terrorism Expeditionary Med, Global War on Terrorism Service Med, Armed Forces Service Med w/ USMC, Humanitarian Service Med x2, Armed Forces Reserve Med, Army Service ribbon, USA Overseas Service x2, FMF ribbon, USN Sea Service Deployment x4, Navy & Marine Corps Overseas Service, US Coast Guard Special Operations Service, NATO Med, Korean Service Med, Kuwait Liberation Med (S), Kuwait Liberation Med (K), Joint Meritorious Unit Commendation, Navy Unit Commendation and the Meritorious Unit Commendation x3. Dr. Kitchen is married to the former Cheryl Annette Swimm. They have four sons and 11 grandchildren.